Backflow to the future | There once was a creek . . . This is not a piece of misguided public art (and hey, we’ve all seen worse). It is called a duckbill valve, and its purpose is to let water flow from the drain into the river but not the other way around. If you don’t think that’s enough to justify its ridiculous appearance, then take a look at the diagram below. Lifted from the Brisbane City Council’s fact sheet on backflow flooding, this diagram illustrates how many parts of Brisbane, including Milton and Rosalie, were flooded in January 2011. The water in these areas did not spill over the riverbanks, but instead snuck in through the stormwater drains that connect to the river. Concept diagram of backflow flooding, taken from the Brisbane City Council’s factsheet. A flap-gate valve installed on a drain by the river at Milton. This duckbill valve is just one of several backflow prevention devices that the Brisbane City Council installed along the river last year. Just nearby at Milton you can find another duckbill as well as a flap-gate, which does essentially the same thing but looks much more sensible.1 Backflow prevention devices have also been, or are being, installed in the Moray Street drainage system in New Farm, and in the Margaret Street, Alice Street and Charlotte Street stormwater systems in the CBD. And if the council’s website is to be believed, these are just the beginning. In response to the 2011 flood, the Brisbane City Council commissioned an investigation into the feasibility of using backflow prevention devices to mitigate flood impacts in flood-prone parts of Brisbane. The 2011 floodline over the drainage systems of Cribb Street (foreground) and Castlemaine Street (Boundary Creek, near the stadium). 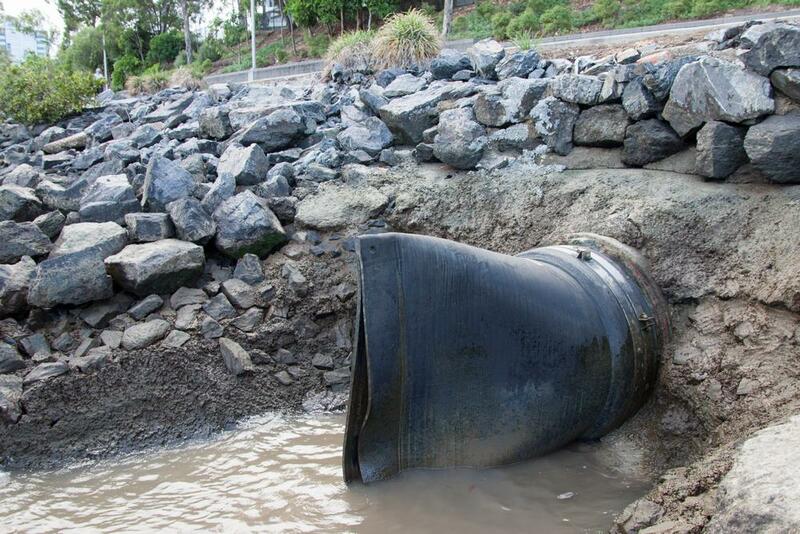 The investigation has focussed on three case study areas — the CBD, Rosalie/Milton and New Farm — while also reviewing other areas along the Brisbane River that may benefit from backflow prevention devices. In addition to the areas where devices have already been installed, the council has identified 11 other priority drainage systems that will receive funding over the next few years. These systems include Castlemaine Street in Milton (the old Boundary Creek), Milton Drain (Western Creek), and just upstream of the Wesley Hospital (what used to be Langsville Creek). The Cribb Street drainage area in Milton, where the duckbills have already been installed, is shown in the foreground of the image to the right. (Before this area was developed, there was a large lagoon in roughly the same location.) 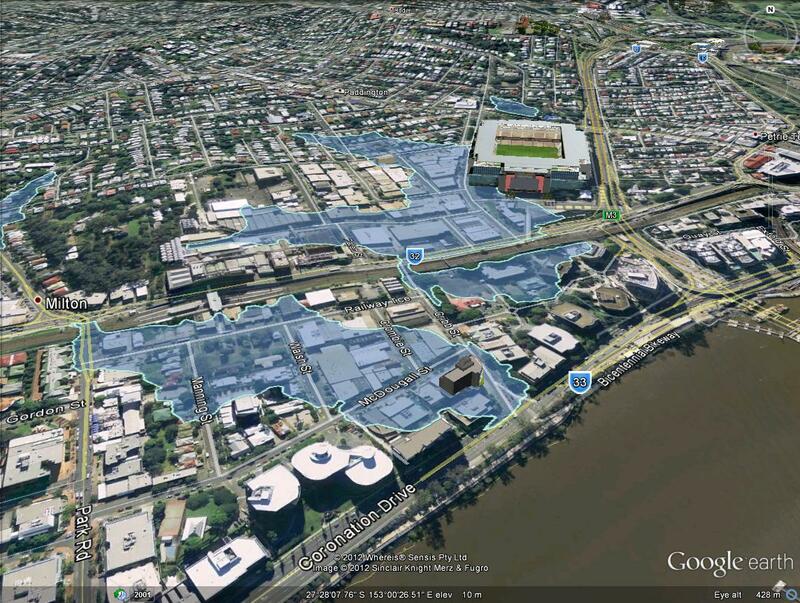 Also shown on the same image is the floodline in the Castlemaine Street (Boundary Creek) system, which runs past Suncorp Stadium. 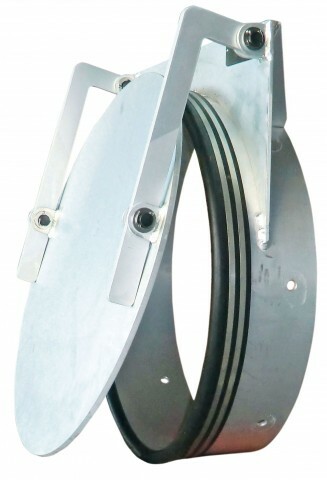 An example of a flap gate. The entrance to Milton Drain presents a bigger challenge. According to the recommendations of the Council’s investigation, there are two structures here onto which backflow devices could be mounted. 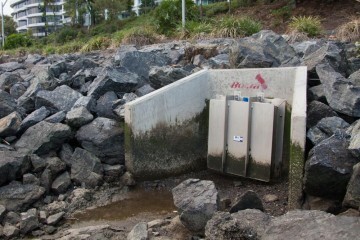 The first is the bridge along the bikeway, across which a series of flap valves could be installed. But this would only protect against a relatively small flood (one that could be expected to occur on average every 20 years). To protect against a flood as big as the one in 2011 (estimated to be a one-in-120-year flood3), the backflow would need to be blocked by a barrage of penstock valves reaching all the way up to the bottom of Dunmore Bridge (Coronation Drive). If you take a walk under this part of Coronation Drive, you can see what an inconvenient space this would be to build in. Not only is the channel large and irregularly shaped, but there is also a pedestrian walkway under the road which would essentially need to be sliced in half to allow the penstock gates to rise. 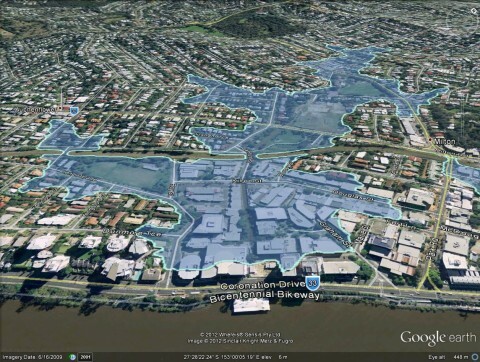 The 2011 floodline in the Western Creek catchment. If the river rose above the level of Dunmore Bridge (like it did in 1974), a backflow prevention device would not prevent the area from being inundated. But it would hold off the inundation until the riverbank is broken, thus buying valuable time in which both people and property could be moved moved to higher ground. Despite posing some challenges, the likely benefits of preventing backflow into the Western Creek catchment seem pretty clear. So clear, that you might wonder why it wasn’t done years ago. After all, it’s not as if floods in the Brisbane River are anything new; on the contrary, they happened more often in the past than they do now. Floodgates are nothing new either: they have been used in various parts of the world for centuries. The dots are there just waiting to be joined. Not surprisingly, the dots have in fact been joined before, and not just once. Proposals for mitigating floods in the Milton area have been floating around for years. After just about every major flood they get rehashed or reinvented, they get talked about in the newspapers, and they get forgotten again. The details vary, but the premise is the same: with some straightforward engineering, Milton can be protected from all but the biggest floods. 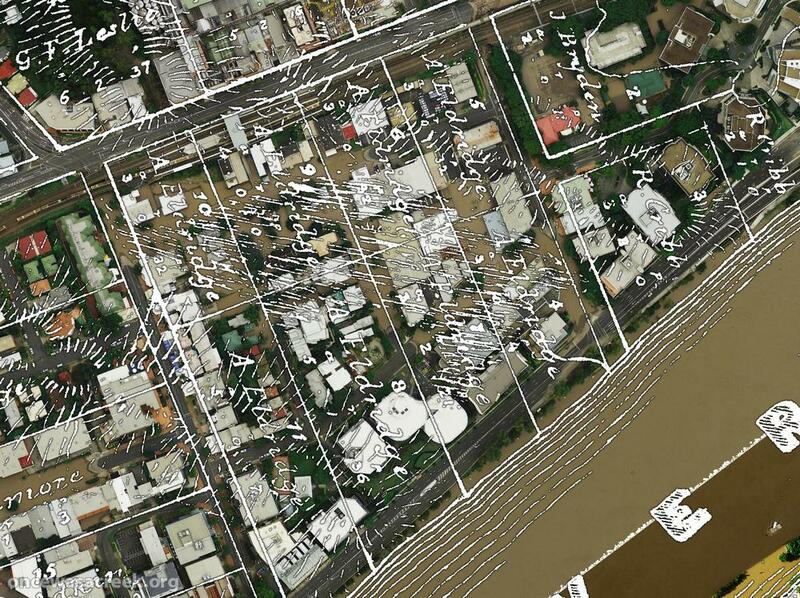 Flood events greater than 1.7m in the Brisbane River since 1841. Also shown are the estimated mitigating impacts of river works and the two dams. 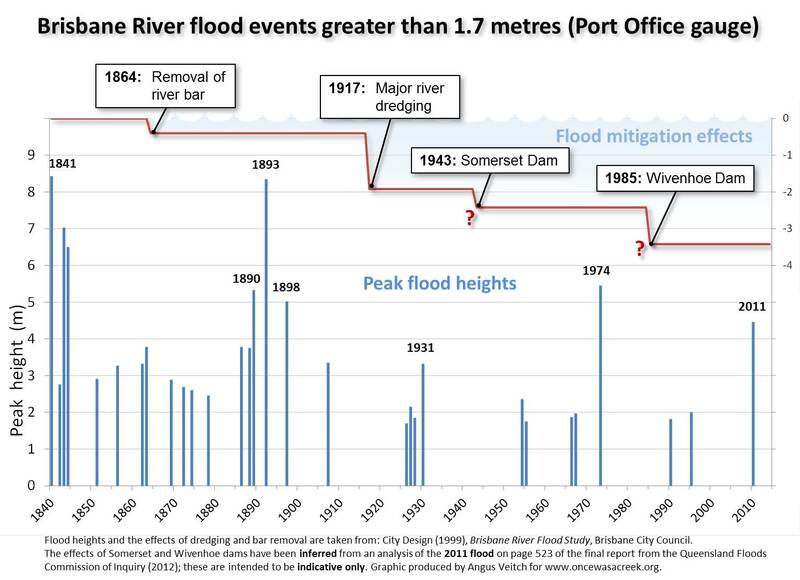 All data are sourced from the Brisbane River Flood Study except the effect of the two dams, which is indicative only and has been inferred from an analysis on page 523 of the final report of the Flood Commission of Inquiry. 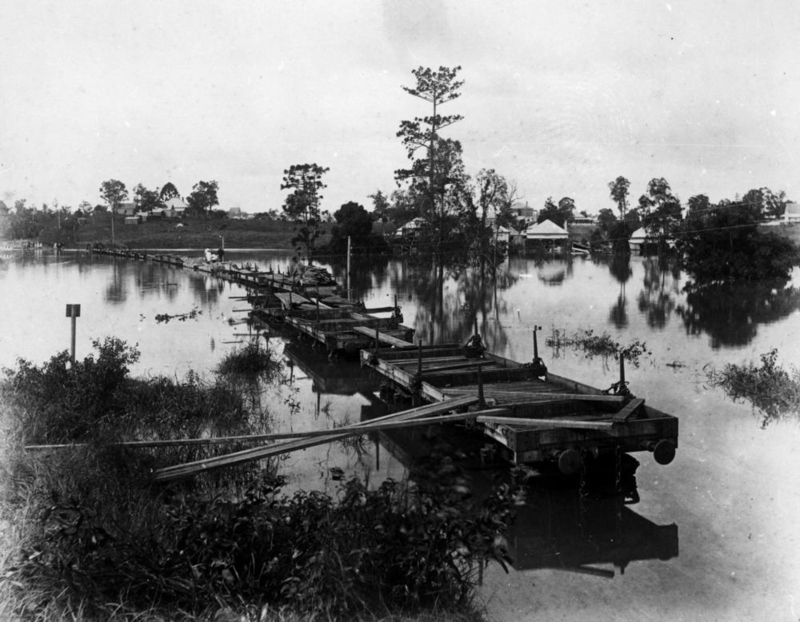 The 1890s was a big decade for floods in Brisbane. The warm-up act was provided by the floods of 1887 and 1889, which peaked at 3.78m 3.75m respectively. The main show began in March 1890, when the river peaked at 5.33m. But even this was just a teaser for the Great Flood (or rather, Floods) of 1893. On the 5th of February 1893, the river peaked at a whopping 8.35m. Two weeks later the river peaked again at 8.09m. In the intervening time there was a minor flood of 2.15m.7 As if to rub salt in the wound, another flood hit in June, this one reaching about 4.2m8 despite occurring in what is traditionally the dry season. To close off the decade, the Brisbane River managed one more major flood, peaking at 5.02m in January 1898. To put these events into perspective, the 2011 flood peaked at a ‘mere’ 4.46m. One might expect such a succession of disastrous floods to give cause for reflection on whether Brisbane had to keep living this way — or indeed if it could afford to. On the 9th of February, 1898, the Milton resident John W. Roberts was reflecting on exactly this when he picked up his pen and wrote a letter to the editor of The Brisbane Courier. This gulf between costs and benefits is unlikely to have closed since 1898. If anything, it has probably widened. For while the likelihood of a major flood has been dampened, the scale of the consequences has been amplified by continued development on the floodplain. While the 2011 flood was smaller than those of the 1890s, the cost of damage done to homes, businesses, roads and other infrastructure must have been much greater. Irving’s proposal would have turned the mouth of the creek into a closed brick culvert instead of the semi-open channel that remains today. Building a floodgate into such a culvert would have been relatively easy. But the Toowong Shire Coucil of the day lacked either the funds or the vision to see the scheme through. Some components, such as the drain through Red Jacket Swamp, sat on the back-burner for years, while others, such as the floodgate, never materialised at all. But the idea never died. All that was needed to bring it back into fashion was another flood. In 1909, presumably in response to the flood of 1908, Alderman Morris of the Ithaca Town Council presented a petition “requesting the erection of a flood gate at the entrance to the Milton drain”.22 The petition was duly referred to the works committee, who in turn must have referred it to the filing cabinet. H.W. 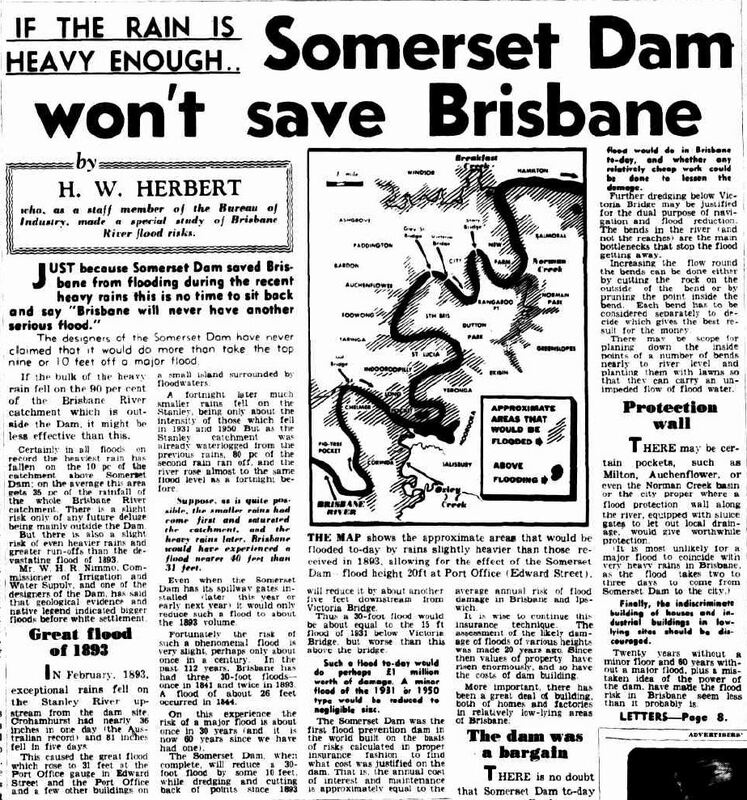 Herbert’s article published in The Courier Mail, 4 March 1953. Twenty-one years passed before the flood Herbert warned about finally came. Somerset Dam was powerless to stop the flood of 1974, and suburbs like Milton and Auchenflower were as exposed as ever to the waters that encroached through the drains and over the riverbank. This time though, there was a definitive response. Although Herbert had reservations about it 21 years earlier, a second dam was now seen as the way to go. Completed in 1985,27 Wivenhoe Dam provided 1.45 million megalitres flood mitigation storage over and above its usual operating capacity of 1.15 million megalitres. Now, with not one but two dams watching over it, Brisbane could finally relax . . . right? The residents of the Milton Estate learned the hard way that a floodgate will only protect against floods to the height of the riverbank. 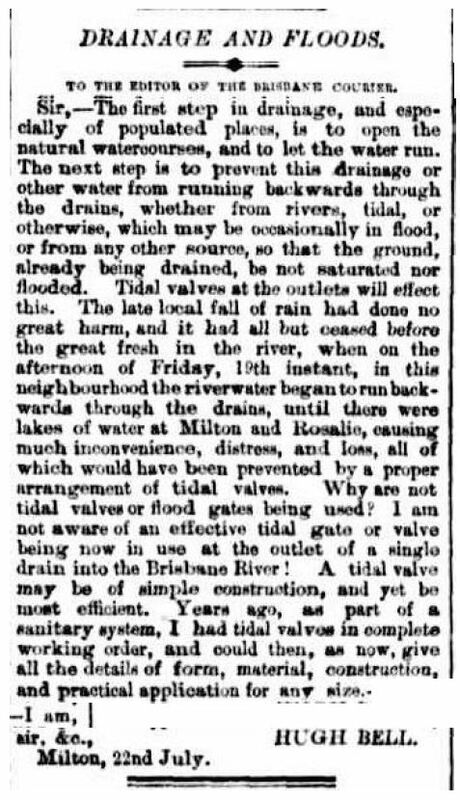 Their floodgate had stopped the 3.75m flood of July 1889, but was ineffectual against the 5.33m flood of 1890. The people who live or own businesses in the same area today would do well to remember that their newly installed duckbills and flap-gates are subject to the same limitation (though it is possible that Coronation Drive is slightly higher in parts today than it was back then). In other words, the floodgate was built to correct for what could generously be called an oversight in urban planning. I don’t know how long the floodgate remained there, but I suspect it was deemed redundant when the drainage system was upgraded. The same correspondence explains that the shire council had “made surveys for, and are about to commence, a low level drain, which will afford relief under most ordinary conditions of rainfall”. This still begs the question, though, of why the floodgate wasn’t retained to guard against moderate flooding from the river, as it had done effectively in 1889. The title of this essay obviously goes a bit too far: nobody really loves the floods (nobody except the commercial newsmedia, anyway). But an alien observer, studying our city from afar for the last 150 years, could be forgiven for wondering why we keep letting the floods back into our lives rather than doing all we can to shut them out. And not only do we leave the door open, we keep building more things for the floods to destroy. Our observer might be led to conclude that although we make a big noise about them, we’re really not that bothered by the floods. Of course, our alien observer would be wrong: the floods clearly do bother us. And yet, time and again, we do a pretty good job of not worrying about them. How do we explain ourselves? Brisbane hasn’t stood by idly in the face of the floods. We’ve built two dams, which between them have the capacity to shave a metre or two off major floods, and all but swallow up the smaller ones. And we’ve made other modifications to the river which, though done primarily to aid navigation, have also reduced the severity of floods. The success of these measures is evident from the lopsidedness of the graph shown earlier. 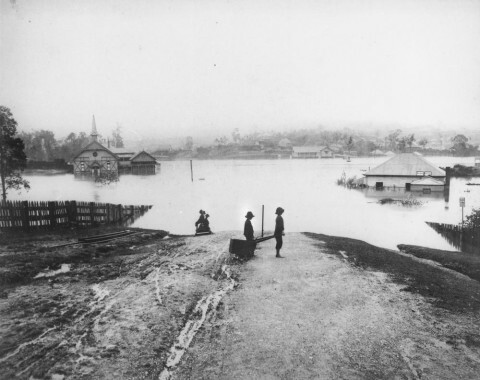 In the 70 years between 1840 and 1910, there were about 21 floods recorded, with an average height of 4.35m and a maximum of 8.43m; in the 100 years since then, there have been just 12 floods, with an average height of 2.56m and a maximum of 5.45m. H.W. Herbert’s warning in 1953 about the limitations of Somerset Dam (discussed above) suggests that the dam’s flood mitigation effects were similarly overestimated. And of course, the same thing happened again after Wivenhoe Dam was built. The conventional wisdom that I absorbed while growing up in Brisbane in the 1980s and 1990s was that a flood like 1974 couldn’t happen anymore — not now that the dam was built. That myth was well and truly busted by the flood of 2011. It’s probably safe to say that every major flood busts a myth like this one. Myths like these need time to develop, and complacency needs time to set in. Over the last hundred years, there has been ample time for this to happen. Since 1910 there have been only three floods in Brisbane high enough to be categorised by the Bureau of Meteorology34 as moderate (2.6m) or major (3.5m), and these occurred 43 and 37 years apart. The longest stretch between such events in the 70 years prior to 1910 was 12 years.35 Given that much of this difference can be explained by the mitigating effects of dredging dam-building, you could almost say that we are victims of our own success in taming the river. Broadly speaking, flood mitigation can be approached in two different ways: by lowering the river, or by containing it. The proposals discussed so far in this essay are examples of the latter: floodgates, backflow valves and levees won’t stop the river rising, but as long as it doesn’t rise too far they will keep selected areas completely dry. Dams, along with river modifications such as dredging and straightening, are examples of the former. The beauty of these measures is that they can lower the level of whole stretches of the river, reducing a flood’s footprint in all adjoining areas. Their drawback is that dams and large-scale river modifications are hugely expensive. If they didn’t provide additional benefits by bolstering water supplies or aiding navigation, it’s hard to know if they would get implemented at all. At a meeting of the Royal Geographical Society in August 1900, Sir Augustus Charles Gregory (former explorer, Surveyor General and the first resident of Rainworth) presented a paper in which he poured cold water on a proposal that had been put forward to construct a dam with a capacity of about 100 gigalitres37 (less than 5 per cent of the capacity of Wivenhoe Dam) to contain an 1893-sized flood. Gregory presented calculations to show that the proposed dam was far too small, and that a dam large enough to do the job would be beyond the means of the colony. He offered a similar opinion when quizzed about the feasibility of constructing canals to allow the river to discharge more quickly to the ocean. The gathering was clearly disappointed at Gregory’s conclusions, given the esteem in which he was held. In the words of one attendee, “it had been clearly demonstrated to them that night how quickly money could disappear in water”. But despite our best efforts, we can only ever shave so many metres off a flood that big. We may have reached the practical limits of our attempts to lower the river. The good news, however, is that we have tamed the river to a point where in many places (such as Milton) the banks will rarely be broken. Backflow prevention devices, perhaps supplemented with levees or raised roads, can therefore be used to great effect, providing full protection against all but the most severe floods. The time to switch to containment mode has come. The minds of our authorities seem sterile, or their hearts grow faint, over such matters. Perhaps they have never seen great public works of the kind, and are incapable of rising to such demands. It is to me a marvel that such a scheme as is here suggested for the districts referred to was not attempted years ago. Roberts’ despair at the authorities of the day was probably justified. The authorities are not the only ones who have been forgetful or complacent about flood risks over the years, but they are the ones charged with taking the necessary action to manage these risks. I suspect it would have been small solace to Roberts to know that after 115 years, the Brisbane City Council is finally rising to the challenge. If and when we do get a floodgate at Western Creek, will we trust it? Should we trust it? Will it work? Sooner or later, we will find out. For although we can never know exactly where the rain will fall, or when it will come, with floods at least one thing is certain . . .
Western Creek now has its floodgate. Read all about it here. I’m wondering if similar studies have been done for rural cities. In the 2011 floods Maryborough had similar back flow problems that cut off important areas in the city that were normally isolated from the river. 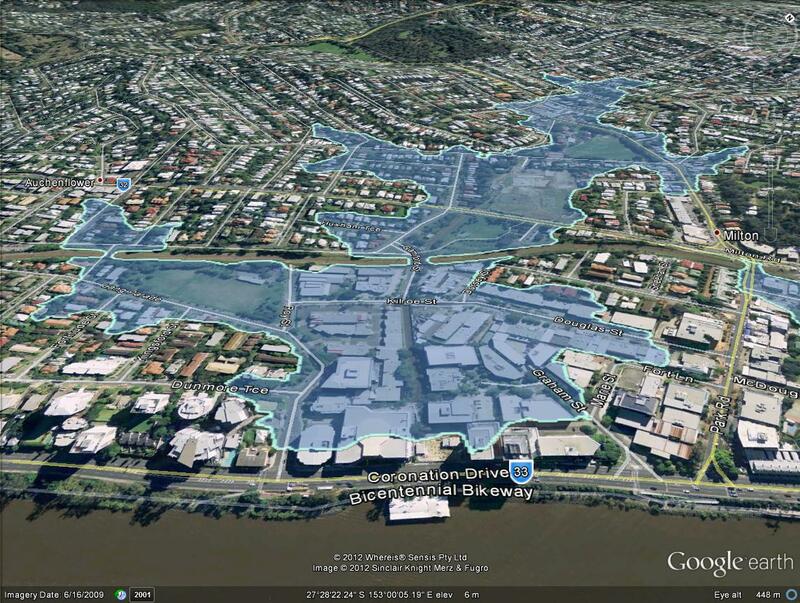 The nearly completed Wivenhoe saved Brisbane from an estimated 8 metre flood in the city, much higher than 1974. History does not take this into account and assumes 1974 is the highest recent flood. Pingback: A floodgate for Western Creek | There once was a creek . . .
Pingback: The legend of the lost lagoon | There once was a creek . . .
Pingback: Are we learning yet? | There once was a creek . . .